Orrite! 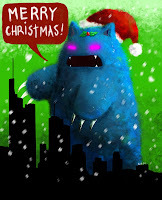 Did this pic for my fellow Crytekkers at work - it's a big fluffy monster destroying Frankfurt, aaaw. :3 Merry Christmas! !